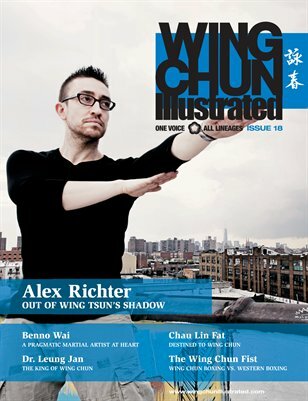 Issue 18 of WCI features Sifu Alex Richter on the cover. Sifu Richter is honest, funny and passionate. Allow him to weave his story of how facing a childhood bully led him to his initial contact with martial arts, along with his infatuation with the infamous Bruce Lee. How the long drives to learn Wing Tsun subsequently led to a move to Germany for three years—and back again. How humour and having fun is essential to any life-endeavour. Sifu Richter can be found running the City Wing Tsun Athletic Association in New York, where he propagates the message of learning a martial art for any personal reason that you can come up with— whether that be for fun, fitness or fighting. For a complete table of contents, please visit our website.